We provide our clients with a hands-on checklist with every inspection to help them understand their ever-changing home so they can preserve its value. A regular maintenance schedule can eliminate most of those expensive emergency repairs while helping to safeguard your family and the value of your home. 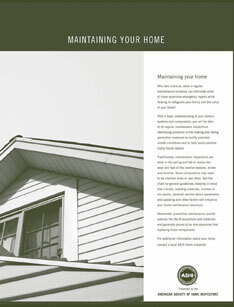 This easy to read checklist provides you with a basic understanding of your home's visible structure and systems which is the scope of your home inspection. The checklist categories are organized by structure and system, and identifies the frequency and time of year to perform regular maintenance inspections.